Success! That's the first and most important thing I want to note. On Nov 19th I had surgery: abdominal reconstruction and revision to my residual limb (sounds gruesome, but those are the technical terms). Both surgeries were planned, and I was lucky to have them both done the same day. Three days later, I woke up (the day before Thanksgiving). As usual, I have dim memories of very bizarre dreams during that time. Anaesthesia seems to do that to me. Discharged on Nov 30th, I've been home for five days already. Recently I participated in a study about chronic pain (actually, the study continues; I've completed the first portion of the study) and it has made me think more deeply about living with pain. Over the past two years, I had become accustomed to living with a certain degree of pain. Largely controlled by medication, my pain level ranged between 0-3 (on the standard pain scale of 0-10, where 0 is no pain and 10 is the worst pain imaginable). If it reached 3, that usually meant that I had forgotten to take my meds. But now, recovering from surgery, it's different. Every morning, I feel like I've been beat up. Everything is sore and achy and my surgery sites are particularly sensitive. Two percocet, one neurontin and a cup of coffee later, and I'm ready to move around a little -- enough to get myself bathed, dressed and fed. But my movements are limited, both by pain and by doctors' orders. I'll be ok with this for a short while, but I can't imagine living with pain for the rest of my life, as do some people. Already I've learned my limitations: pain impacts my ability to concentrate, to plan for the future, to maintain an upbeat frame of mind. Luckily for me, the pain will recede as my body heals. Also, I try to keep meds to a minimum. They dull my thought processes and reduce my stamina. (I'm trying to get some work done!) I read about the success of acupuncture for treatment of phantom limb pain. Once I'm recovered from these recent procedures, I'm going to give it a try. Best wishes to all for a pain-free year! I've been making hats -- lots and lots of hats. Because I've been experimenting with stitch patterns (and therefore learning how to calculate sizes), my results have come out to be all shapes and sizes. Some very large, some small. So far I've made 10 or 12 hats: some will go to friends and family, but so far I've finished seven for charity. Maybe I'll get 10 done by the end of the year. While in Mali, I met a lot of Peace Corps volunteers (PCVs). I've decided that I'm going to send the hats I make to the PCVs in Bandiagara and have them distribute them as needed. Who better, I thought, to understand local needs and be able to receive and easily distribute my small gift? I've been knitting. Most of my readers likely know that already. I learned to knit as a child; needlework is a skill shared by all of the women in my mother's family. But it was something I hadn't touched in years (probably not since I was a child). Shortly after I was released from the hospital, though, I thought of it as a useful activity I could do while in bed. Also, my good friend Sharon Turner is a master knitter, and she gave me inspiration (and books and yarn to get started). I soon realized that it's the action of knitting that gives me the most pleasure. Don't get me wrong, I'm a sweater lover. (Really more of a sweater addict.) I love the textures and colors of yarns and the soft warmth of knitted fabric. But I quickly realized that it's the act, the craft of knitting, that I enjoy the most. Knit a Square: South Africa. Collects 8 in x 8 in knit squares and stitches them into blankets which are distributed to children's charities. Haiti Earthquake Relief Project: Global Knit, based in Ohio, is collecting wash kits composed of a knitted washcloth, hand towel and bar of soap and is working with Food for the Poor to distribute them to earthquake victims in Haiti. Bulgarian Orphans: Another Global Knit project, collects clothing for disabled orphans of all ages and distributes it through Cedar Foundation in Bulgaria. Knitting and Giving: based in Connecticut, this group collects knitted items and hand-delivers them to needy people all around the world. Their "Call For Items" lists all the projects they are currently collecting for. Lately I’ve been knitting hats. It keeps my hands busy and I get to experiment with new stitch patterns without making the long-term commitment required of a sweater or blanket. It also provides a use for all those extra bits of yarn that are leftover after a bigger project or that have been given to me by friends. It takes only one skein to make a hat or scarf. Usually I have to calculate too (keeps the quant side of my brain nimble), though it has taken me awhile to get the finished size right for different stitches (cables and so on come out smaller, for example). Consequently, many of the hats are small and two of them came out much bigger than I expected. I decided that I’d just keep going, keep making more hats – I have about eight so far – and donate them to people who need hats. If you're a member of Ravelry.com, you can follow my knitting progress. Even pictures of all the hats. I'd almost given up on writing a blog. I'm a very private person and was feeling self-conscious about sharing my thoughts and ideas. But I've decided to give it another go. My best thinking happens while I'm physically active. It seems that while my body is occupied, my mind is free to wander. And the less I try to direct my thoughts, the better I am at sorting them out. It may even be more enjoyable than dreaming. Often, while I'm swimming, I compose posts to share. The thought, the word choice -- it all seems so entertaining and perfectly structured. But then, once I've had the pleasure of experiencing it, it seems unnecessary to write it down. Follow this link to watch me ski! 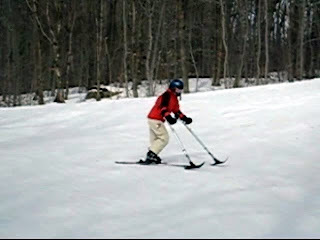 Skiing with the Gaylord Hospital adaptive sports team at Bromley Mountain, February 6th. (In the video, that's my instructor coming in behind me.) Can I even describe how difficult it is to ski on one leg? Try doing squats for two hours without stopping. Now do that on one leg. Nonetheless, it feels great to be out on the mountain. And both the Gaylord team and the adaptive sports program staff at Bromley are incredibly caring. I've been lucky to ski three times this winter--and I'm going again this Saturday! It's essential: acceptance of my new, disabled, physical state. 1) First of all, accept the fact that once you get your shoes on you'll likely be wearing them for a few days. I used to love changing my shoes often, choosing the pair that would be just right for my outfit and slipping into slippers when I got home. Now I accept that I'll be wearing the same boots for a day or two--or three--in a row. 2) Get a professional metal shoehorn (expensive, yes, but worth it). Plastics will break. Even the long metal shoehorn designed for people with disabilities wasn't strong enough. 3) Look for boots made from supple leather with zippers that go very low on the foot. You need a large opening to get the boot over your ankle. 4) Always use a sock--a smooth nylon is good. 5) Consider getting a foot that's a half size smaller than your real foot. This may sound radical, but it's worked for me. 6) Online shops such as zappos.com andendless.com offer free shipping (and free return shipping). This has been incredibly helpful--I can order two or three different styles and try them on at home. Above all, have patience. Keep trying. And when you find something that fits, that you like--consider buying two pair. Here are three boots that have worked for me. Please also post your recommendations.